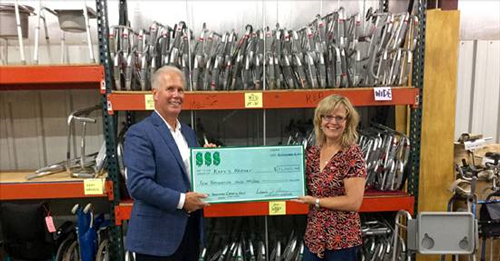 TOTAL Mechanical held a charity golf outing on Aug. 15, 2015 in memory of Valerie Sullivan, a former employee, benefiting Katy’s Kloset and raised an amazing $10,000. Dennis Braun, president/CEO of TOTAL Mechanical, presents a check to Wendy Clark, president of Team Up! with Families.